FRONTLINE ® Plus for Dogs provides fast, effective and convenient treatment and control of fleas and ticks for dogs and puppies. 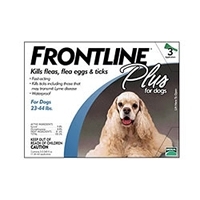 FRONTLINE® Plus stops and prevents infestations and kills adult fleas, flea eggs, and flea larvae. This effective flea treatment prevents all flea stages (eggs, larvae, pupae) from developing and kills fleas that may cause flea allergy dermatitis. Frontline flea and tick treatment also kills all stages of deer ticks (which may carry Lyme disease), brown dog ticks, American dog ticks, and lone star ticks, while preventing and controlling re-infestations. Ticks are more than a nuisance- in some cases, they may transmit serious diseases to your dog or even to you. To kill ticks that may carry and transmit these serious diseases, count on the control of FRONTLINE ® Plus.